Big Ice DamBasically, an ice dam is exactly that, a dam of ice. It works just like a dam on a river, backing up the flow of water. Ice dams typically occur in the gutters or the edge of the roof, where snow that has been melted by heat loss, sun or some other external cause re-freezes. This cycle can continue until the layers of ice build up and form a dam. Melt water can back up behind roof ice dams and leak under the shingles or flashing. Gutters that are frozen solid cause the melt water to run over the front or back of the gutter, or both. Generally, if you see icicles hanging from your gutters it means that they are full of ice. 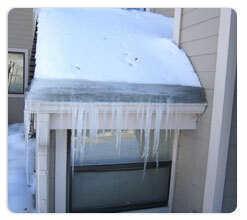 The weight of the ice and icicles can cause the gutters to pull away from the fascia or worse yet, fall off. Also, the melt water can go behind the gutters and fascia and end up leaking into the interior of your home. Ice Dam Removal, until recently, the only option to remove ice dams was to either wait for it to melt or “hack” it loose with a hammer or ice pick. We’ve seen thousands of gutter systems damaged by ice damming and the attempts to remove the ice with an implement of destruction. 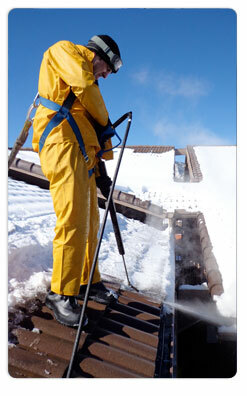 Colorado Seamless Gutters now has the ultimate ice dam removal machine: the Arctic Steamer. Made by American Pressure Washer specifically for ice dam removal, the Arctic Steamer uses high temperature, low pressure steam to safely and effectively remove ice dams. Our trained, experienced technicians can remove your ice dam today, before it causes water damage or creates a dangerous slip hazard.